LUX-ZEPLIN (LZ), a next-generation dark matter detector that will be at least 100 times more sensitive than its predecessor, has cleared another approval milestone and is on schedule to begin its deep-underground hunt for theoretical particles known as WIMPs, or weakly interacting massive particles, in 2020. An underground detector reports zero detections of weakly interacting massive particles (WIMPs), the top candidate for mysterious dark matter. The Davis cavern, deep within what used to be the Homestake Mine, before the placement of the LUX experiment. Founded in 1876, the town of Lead in South Dakota hummed along as a mining community for more than a century. Homestake Mine employed thousands in the largest, deepest, and most productive gold mine in the Western Hemisphere. Now scientists are using it to mine for gold of a darker kind. More than a mile underground, where miners once accessed precious ore, sits a 3-foot-tall, dodecagonal cylinder of liquid xenon. The 122 photomultiplier tubes at the container’s top and bottom await the glitter of light that would signal an elusive dark matter shooting through the cylinder and interacting with one of the xenon atoms. But after more than a year of data collecting, the Large Underground Xenon (LUX) experiment announced last week at the Identification of Dark Matter 2016 conference that they’re still coming up empty-handed. Weakly interacting massive particles (WIMPs) are the top candidates for dark matter, the invisible stuff that makes up about 84% of the universe’s matter. By definition, dark matter doesn’t interact with light, nor does it interact via the strong force that holds nuclei together. And while we know it interacts with gravity, that interaction leaves only indirect evidence of its existence, such as its effect on galaxy rotation. 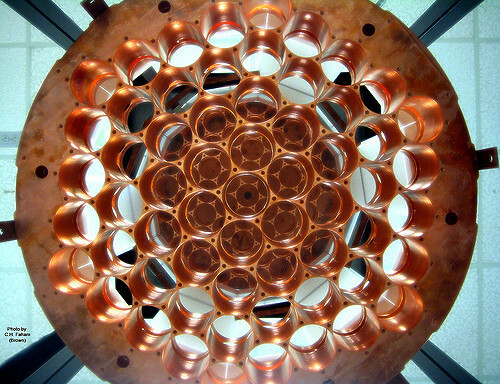 This bottom view shows the photomultiplier tube holders in the LUX experiment. But WIMP theory says dark matter particles should also interact via the weak force, a fundamental force that governs nature on a subatomic level — including the fusion within the Sun. So a WIMP particle should very rarely smash into a heavy nucleus, generating a flash of light. The chance for a direct hit is very, very low, but 350 kilograms (770 pounds) of liquid xenon in the LUX experiment should have good odds. After just three months of operation, in 2013 the LUX experiment had already reported a null result. At the time, the experiment had probed with a sensitivity 20 times that of previous experiments (check out the graph here to see how three months of LUX ruled out numerous WIMP scenarios). A new 332-day run began in September 2014, and the preliminary analysis announced last week probes four times deeper than the results before. Yet despite a longer run time, increased sensitivity, and better statistical analysis, the LUX team still hasn’t found any WIMPs. Simply put: either WIMPs don’t exist at all, or the WIMPs that do exist really, really don’t like interacting with normal matter. It’s also worth noting that LUX isn’t just looking for WIMPs. The WIMP scenario is the primary one it’s testing, and the one that last week’s announcement focused on. But more results are forthcoming about LUX results on dark matter alternatives, such as axions and axion-like particles. The non-finding may not win any Nobel Prizes, but in a way it’s great news for physicists. Numerous experiments (such as CDMS II, CoGeNT, and CRESST) had found glimmers of WIMP detections, but none had found results statistically significant enough to be claimed as a real detection. The LUX results have been helpful in ruling out those hints of low-mass WIMPs. For the technically minded, this is the result that was presented at the Identification of Dark Matter conference in Sheffield, UK. The plot shows the possibilities for dark matter in terms of its cross-section — the bigger the value, the more easily it interacts with normal matter — and its mass. (The mass is given in gigaelectron volts per speed of light squared, which translates to teeny tiny units of 1.9 x 10-27 kg.) LUX’s most recent results rule out any dark matter particles with mass and cross-section that place them above the solid black line. The upshot is that LUX, the most sensitive dark matter experiment to date, is narrowing the playing field, especially for low-mass WIMP scenarios. That’s why — despite not finding any WIMPs this time around — the LUX team continues to work on the next-gen experiment: LUX-ZEPLIN. Its 7 tons of liquid xenon should begin awaiting flashes from dark matter interactions by 2020. Three years of data from LUX-ZEPLIN will probe WIMP scenarios down to fundamental limits from the cosmic ray background. In other words, if LUX-ZEPLIN doesn’t detect WIMPs, they don’t exist — or they’re beyond our detection capabilities altogether. Last week, the Large Underground Xenon (LUX) collaboration announced a whole new level of sensitivity for its dark matter experiment. Although no dark matter particles were found, LUX’s sensitivity far exceeded the goals for the project. The results give researchers confidence that if a particle had interacted with the detector’s xenon target, they almost certainly would have seen it. “It would have been marvelous if the improved sensitivity had also delivered a clear dark matter signal. However, what we have observed is consistent with background alone,” said Rick Gaitskell, professor of physics at Brown University and co-spokesperson for LUX. The new results allow scientists to eliminate many potential models for dark matter particles, offering critical guidance for the next generation of dark matter experiments. The final results were announced at the Identification of Dark Matter 2016 conference and signaled the completion of a 300-live-day search that ended in May. During a 20-month run, the LUX team incorporated unique calibration measures to search a wide swath of potential parameter space for dark matter particles called WIMPs, or weakly interacting massive particles. “These careful background-reduction techniques and precision calibrations and modeling, enabled us to probe dark matter candidates that would produce signals of only a few events per century in a kilogram of xenon,” said Aaron Manalaysay, the Analysis Working Group coordinator for LUX and a research scientist from UC Davis, who presented the new results in Sheffield, UK. With the completion of its final run, LUX is preparing for decommissioning this fall. But before that, the LUX team plans to use the detector to continue calibrating and testing backgrounds in preparation for the next generation dark matter detector, LUX-ZEPLIN (LZ). “The main driver behind this campaign of calibrations is to test new techniques or improve on existing techniques, which will be used for LZ,” said Simon Fiorucci, a physicist at Lawrence Berkeley National Laboratory and science coordination manager for the experiment. LUX has sufficient size, low-enough background and a known response that can tell researchers if the techniques will work. Fiorucci said some interesting science also can come out of some of these tests. For example, the neutron generator studies done in June and July could further improve understanding of the xenon response to WIMP interactions at extremely low energy. “This would be a boon to LZ, LUX and the entire field of dark matter,” he said. The LZ team also plans to measure the intrinsic radioactivity of a liquid scintillator mix that will be used with LZ and requires an extremely quiet environment. The scintillator will replace LUX inside the high-purity water tank. “This critical piece of information will tell LZ whether their background is good enough for the outer detector to perform as expected and, if not, where they should focus their efforts to make it so,” Fiorucci said. The tests will run through January. ENECTALI FIGUEROA-FELICIANO – is a member of the SuperCDMS collaboration and an associate professor of physics at the MIT Kavli Institute for Astrophysics and Space Research. HARRY NELSON – is the science lead for the LUX-ZEPLIN experiment and is a professor of physics at the University of California, Santa Barbara. GRAY RYBKA – leads the ADMX Gen 2 experiment as a co-spokesperson and is a research assistant professor of physics at the University of Washington. THE KAVLI FOUNDATION: We know that dark matter is five times more prevalent than ordinary matter, and we’re able to infer that clumps of dark matter help hold together clusters of galaxies. So this substance is a huge part of what makes up our universe and an important part of why our universe looks the way it does. Why, then, haven’t we been able to observe it directly? What’s holding us back? HARRY NELSON: A big part of the challenge is that dark matter doesn’t interact with us very much. We know that dark matter is passing through our galaxy all the time, but it doesn’t disrupt the type of matter we’re made of. But more than that, dark matter doesn’t interact with itself very much either. The matter that we see around us every day interacts with itself: Atoms form molecules, the molecules form dirt, and the dirt forms planets. But that’s not the case with dark matter. Dark matter is widely dispersed, and doesn’t form dense objects like we’re used to. That, combined with the fact that it doesn’t interact with our type of matter very often, makes it hard to detect. ENECTALI FIGUEROA-FELICIANO: What Harry says is exactly right. In my mind, nature is being coy. There’s something we just don’t understand about the internal structure of how the universe works. When theorists write down all the ways dark matter might interact with our particles, they find, for the simplest models, that we should have seen it already. So even though we haven’t found it yet, there’s a message there, one that we’re trying to decode now. Gray RybkaGray Rybka leads the ADMX Gen 2 experiment as a co-spokesperson and is a research assistant professor of physics at the University of Washington. TKF: In fact, nature is being so coy that we don’t yet even know what dark matter particles look like. Gray, your experiment – ADMX – looks for a different particle altogether than the one that Tali and Harry look for. Why is that? 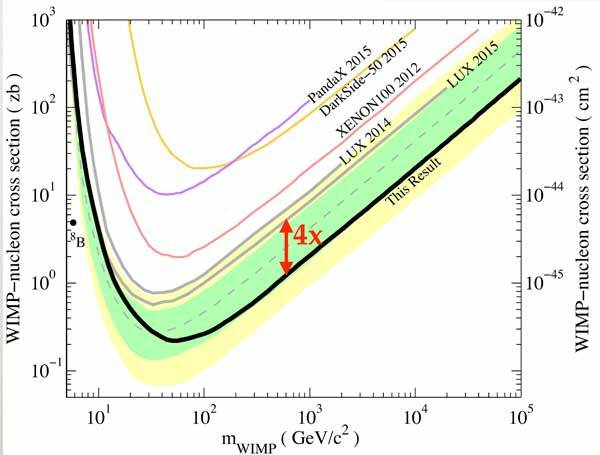 Both the WIMP and the axion are really good dark matter candidates. They’re especially great because they would explain both dark matter and other mysteries of physics at the same time. I suppose I like the axion because there aren’t a lot of experiments looking for it. If I’m going to gamble and spend a lot of time making an experiment to look for something, I don’t want to look for something that everyone else is looking for. We’ve been updating the ADMX experiment since 2010 and have demonstrated that we have the tools necessary to see axions if they are out there. ADMX is a scanning experiment, where we scan the various masses this axion could have, one at a time. How fast we scan depends on how cold we can make the experiment. With Gen2, we’re buying a very, very powerful refrigerator that will arrive next month. Once it arrives, we’ll be able to scan very, very quickly and we feel we’ll have a much better chance of finding axions – if they’re out there. NELSON: Even though I’m betting on WIMPs, I like axions too. I even wrote some papers on axions way back when. But these days, as Gray said, I look for WIMPs. My collaboration is currently operating the Large Underground Xenon, or LUX, experiment in the famous Black Hills of South Dakota, inside a mine that was the outgrowth of the 1876 gold rush that formed the city Deadwood. This month, we start our 12-month run with LUX. We’re also now carefully developing our plans to upgrade our detector to make it more than 100 times more sensitive for the new LUX-ZEPLIN project. But to tell you the truth, I actually have a little bit of the attitude that all of these possibilities are unlikely. I’m not saying that hunting for them is worthless; that’s not it at all. It’s just that nature doesn’t have to respect what physicists want. We desire to better understand our own strong interaction, the mechanism responsible for the strong nuclear force which holds the atomic nucleus together. The axion would help do that. The WIMP is great because it’s consistent with the physics of the Big Bang in a straightforward way. A lot of science is based on what’s called Occam’s razor: We make the simplest possible assumptions and then test them very well, and only give up simplicity if we absolutely need to. I’ve always felt that the WIMP is a tiny bit simpler than the axion. Both are unlikely, but are still the best candidates we can think of. It’s probably more likely that dark matter is somewhat different than either the WIMP or the axion, but we must start somewhere and the WIMP and axion are the best starting points we can imagine. TKF: If you think it’s unlikely that the WIMP is out there, why do you look for it? NELSON: The WIMP and axion have the absolute best theoretical motivations. And so it’s great that both WIMPs and axions have really strong experiments going after them. Tali Figueroa-Feliciano​Enectali (Tali) Figueroa-Feliciano is a member of the SuperCDMS collaboration and an associate professor of physics at the MIT Kavli Institute for Astrophysics and Space Research. FIGUEROA-FELICIANO: As an experimentalist, I come at this from the point of view that theorists are very clever, and have come up with an incredible array of possible scenarios for what dark matter could be. And, as Harry said, we attempt to use Occam’s razor to try to weed out which of these things are more probable than the others. But that’s not an infallible way to go about it. Dark matter might not follow the simplest explanation possible. So we have to be a little agnostic about it. In a way it’s like looking for gold. Harry has his pan and he’s looking for gold in a deep pond, and we’re looking in a slightly shallower pond, and Gray’s a little upstream, looking in his own spot. We don’t know who’s going to find gold because we don’t know where it is. That said, I think it’s really important to stress how complementary these three searches are. Together, we look in a lot of the places where dark matter could be. But we certainly don’t cover all of the options. As Harry says, it could be that dark matter is there, but our three experiments will never see anything because we’re looking in the wrong place – it could be in another fork of the river, where we haven’t even started looking yet. RYBKA: I look at it a bit more optimistically. Although as Tali said all the experiments could be looking in entirely the wrong place, it’s also possible that they’ll all find dark matter. There’s nothing that would require dark matter to be made of just one type of particle except us hoping that it’s that simple. Dark matter could be one-third axions, one-third heavy WIMPs and one-third light WIMPs. That would be perfectly allowable from everything we’ve seen. FIGUEROA-FELICIANO: I agree. I should have said that the gold nugget we’re looking for is a very valuable one. So even though the search is hard, it’s worthwhile because we’re looking for a very valuable thing: to understand what dark matter is made of and to discover a new part of our universe. There’s a very beautiful prize at the end of this search, so it’s absolutely worthwhile. TKF: Tali, tell us a little about the pond where you’re panning for that very valuable nugget of dark matter. 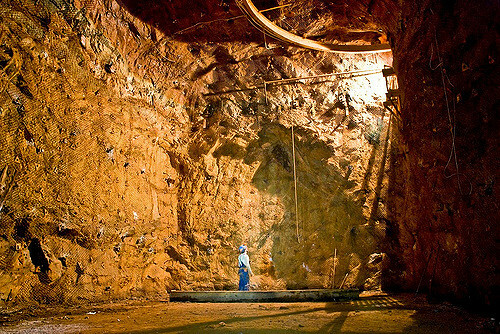 FIGUEROA-FELICIANO: My experiment is currently running in Soudan, Minnesota, inside a mine that’s a bit over half a kilometer (at 2,341 feet) underground. This experiment, called SuperCDMS Soudan, was designed to demonstrate a new technology we’ve been developing that allows us to search for WIMPs that are on the lighter-mass side. It turns out that certain classes of WIMPs, ones that are lighter than Harry searches for, deposit very little energy into detectors. Our detectors are able to distinguish very small amounts of energy deposited in the detector from all the many different signals that we get from radioactive materials, cosmic rays, and all sorts of other things that stream though our detectors. Being able to make that separation is very important, both for SuperCDMS and for LZ. The next step for our experiment is called SuperCDMS SNOLAB. SNOLAB is a nickel mine in Canada that’s 2 kilometers (6,531 feet) deep. We’ve been approved to build a brand new experiment down there to search for these low-mass WIMPs. Also, if LUX or LZ sees a higher mass WIMP, we’ll be able to check that measurement. Right now, we’re in the process of finalizing the design and taking the first steps of putting this brand-new SNOLAB experiment together. We expect to have a first phase of detectors in the next couple of years. RYBKA: Bottle it and sell it, I guess! But really, I’d say that all of the experiments would need to keep going even after such a discovery, until someone could conclusively prove that the discovered dark matter makes up 100 percent of all the dark matter in the universe. NELSON: I would agree with that. We would also need to dig in and really try to understand what we discovered. There’s an old saying in particle physics that you haven’t discovered a particle until you know its mass, spin and parity, a property that’s important in the quantum-mechanical description of a physical system. To really discover dark matter, we’ll need to prove that it’s what we think it is, and we’ll need to learn its characteristics. After you discover a particle, everyone gets a lot smarter at what to do with it. This has been going on with the Higgs boson lately. Folks at the Large Hadron Collider are getting cleverer because now that they’ve seen the particle, they can focus on interrogating it. When we start to do that with dark matter, we’re going to see something new. That’s just how scientific progress works. Right now, we can’t see through the wall because we haven’t figured out what the wall is made of. But once we understand what’s in the wall – my analogy for dark matter – we’ll see through it and see to the next thing. Then, people will come up with 100 different ways to test the particle’s properties, as Harry described. After that, a phase of “dark matter astronomy” will help us learn the particle’s role in the universe. We’ll want to measure how fast it’s going, how much of it there is, how it behaves in a galaxy. TKF: There’s clearly a lot to be done once we find even just one type of dark matter particle. But it sounds like there could be a whole new zoo of dark particles. Do you think we’re going to need a “Dark Standard Model”? NELSON: I’ve often had the following thought: Here we are, in our measly 15 percent of the matter in the universe, wondering what dark matter is. If dark matter is as complex as we are, it might not even know that we exist. We’re just this minority 15 percent, but somehow we think we’re so important. But experiments undertaken by dark matter might not even know that we exist because we’re a much smaller perturbation on dark matter’s world than dark matter is on us. The dark matter sector may be as complex – or perhaps even five times as complex – as ours. Just as we’re made mostly of atoms made up of electrons and nuclei, maybe dark matter is too. In some of the searches for WIMPs, you have to be careful about that. It may be that the way these things interact with our matter is rather different than the simplest possible case that we’re looking for. FIGUEROA-FELICIANO: Harry, if you were to apply Occam’s razor to our universe, how does it fare with the Standard Model? NELSON: Well, it doesn’t do very well. The Standard Model is a lot more complex than it needs to be. So maybe the same is true for dark matter. Maybe there are even dark photons out there. The idea is interesting. With ADMX, Gray is looking for a particle that has to do with the strong interaction. Tali and I are looking for a particle that has to do with the weak interaction. And searches for the dark photon look for a relationship between the electromagnetic interaction and the dark matter sector. The community really wants to figure out dark matter. There’s a feeling of urgency about it, and we’ll look for it in all the ways that we can. RYBKA: It’s true. With ADMX, we’re mostly focused on the axion, but we also look for dark photons at the lower masses. There are the dark matter candidates that people are really, really excited about, like axions and WIMPs. Those get experiments built that are dedicated to them. And then there are the ideas that might be good but don’t have quite as much motivation, like dark photons. People still look for ways to test those ideas, often with existing experiments. TKF: It’s clear there are a wide variety of places where we could find dark matter. We’re panning for this gold wherever we can, but we’re not entirely sure that it exists anywhere we’re looking. What’s it like searching for something that you might never find? FIGUEROA-FELICIANO: I think that the people who work on dark matter have a certain personality, a bit of a gambler’s streak. We go for the high stakes, putting all the chips in. There are other areas of physics where we would be sure to see something. Instead, we choose to look for something that we might not actually see. If we do see it, though, it’s a huge deal. We’re extremely lucky that we actually get paid to try to figure out what the universe is made of. That’s an incredibly wonderful thing. NELSON: Sometimes I think of what it must have been like to be Columbus and his crew, or the explorers who first went to the Earth’s poles. They were way out in the middle of the ocean, or in the ice, not quite sure what would come next. But they had set goals: India and China for Columbus, the poles for those explorers. 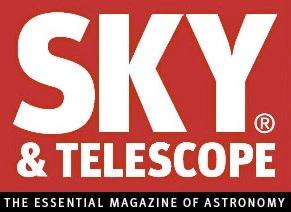 We’re explorers too, we set goals for ourselves too, to seek certain pre-defined sensitivities to dark matter. We’re innovating with modern technology to reach our specific goals. And we may make it the New World or the North Pole, and that’s wonderfully exciting. See the full article, with other material, here.